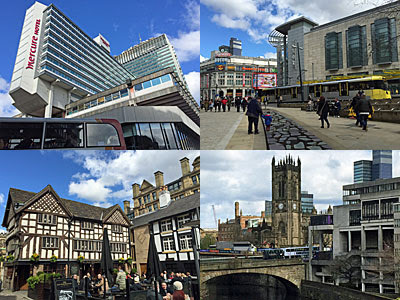 England's second city, in stature if not in population, rose to international prominence in the 19th century on the back of the Industrial Revolution. Textile manufacturing brought it riches, until the rest of the world learned to spin cotton cheaper, and the city has since reinvented itself as a hub of innovation and culture. Its centre is very Victorian, but simultaneously very modern, with shiny modern flats shooting up everywhere above a dark brick skyline. And there's tons to see and do, as I tried to discover when I spent ten hours in the city (and the city nextdoor) at the weekend. Here are ten places I managed to fit in, every single one of them with free admission, because Manchester's damned excellent like that. Built on the site of the Manchester Royal Infirmary, and just up the road from Manchester Piccadilly station, this is the largest greenspace in the centre of town. It's a fraction bleak, with a slightly featureless lawn and a couple of old monuments thrown in, but some fenced-off regeneration is going on, with the fountain switched off and alongside what looks like a giant crazy golf hole being added with metallic swirl and droplet-splattered hump. A thin silver building divides off the main piazza from Manchester's main road transport hub, where dozens of buses congregate and yellow trams glide in from Didsbury, Eccles and Bury. The tourist information centre in the corner was a disappointment, I've rarely seen one so lightly stocked, but the ladies on duty were charming. 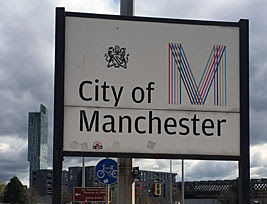 It might not be why you'd visit, but most people come to central Manchester to shop. The Arndale Centre is enormous, having taken advantage of the aftermath of the IRA bomb in 1996 to regenerate and renew itself. The biggest bomb to be detonated in Great Britain since World War II was stashed in the back of a van on Corporation Street, killing nobody due to a timely evacuation, but causing massive damage. A postbox close to the epicentre survived and has been reinstated, complete with commemorative plaque, below a replacement bridge (in twisty glass) linking Marks & Spencer to the Centre opposite. Although the surrounding precincts are almost entirely modern, a couple of surprisingly old buildings lurk in Shambles Square, lifted wholesale from their original position 300m to south. One is the half-timbered Old Wellington, the city centre's only surviving Tudor building, while nextdoor is Sinclair's Oyster Bar, an 18th century Punch House now run by Sam Smiths, and a popular pub with the shaven-headed. There are more interesting cathedrals, to be frank, but Manchester came late to the diocesan game (circa 1847, if you're asking). Nevertheless the rededicated building is medieval, in perpendicular Gothic, which helps it to blend perfectly with much of the city's later architecture. I think I'd have been more impressed had the centre of the (record-breakingly-wide) nave not been curtained off for renovation work. Let's build a Museum of the City, said the council at the millennium, not just our city but every city, because urbanisation is a fascinating thing. Visitors disagreed, and came in disappointingly small numbers, to journey up the mega-escalator and then wander down through a cascade of galleries inside a wedged-shape façade of glass. So in 2004 they broadened its appeal to focus instead on British culture, and when even that didn't work they stole the National Football Museum from Preston and shoved that inside instead. I considered actually going inside to "learn more" about the beautiful game, but decided not to sully my memories of visiting in 2003 back when the interior was proper urban. This Neo-Gothic bookstack is a proper treat. Enriqueta Rylands' tribute to her late husband took ten years to build, finally opening in 1900, and better resembles an ornate church than a university library. Entrance is via a modern four-storey extension, with cafe, from which you step inside a dark maze of passages with stone bosses embellishing the ceiling and chambers filled with complete sets of ancient volumes. In one exhibition cabinet is Papyrus P52, which some experts believe is the oldest surviving fragment of New Testament text, ripped from St John's gospel chapter 18. A tall open staircase leads up to a nave-like reading room, where sweaty students with satchels pore over essays on laptops, and visitors wander around in mild awe. Appropriately located on a street called Left Bank, this repository of political ephemera started out as the National Museum of Labour History in Limehouse E14. Rescued by Manchester Council and the TUC it's ended up here, in a converted water pumping station, and is described as "a march through time following Britain's struggle for democracy over two centuries." It's unusual to see history represented from a radical viewpoint, never outrageously so, but with a relentless focus on social conditions, reform and protest. Here the key events in British life include strikes and struggle, and several of the items on display are brightly coloured banners. You probably already know whether you'd enjoy looking round, but I found it refreshingly thought-provoking rather than militantly preachy. As its name suggests you have to deliberately hunt this 18th century church down, accessed via two back alleys, or approached via a tented village of rough sleepers beneath a stilted concrete office block. But step inside and an oasis of calm awaits, spacious and ornate with marble pillars. To the left of the high altar is the shrine of Our Lady of Manchester, because such a thing exists, while an acclaimed set of modern-art Stations of The Cross runs along two adjacent walls - Sister Wendy was so very impressed. As a reader of this blog, I can pretty much guarantee you'd like this one. Essentially a collection of local technology, its extensive footprint surrounds the oldest surviving railway station anywhere in the world. That's Manchester Liverpool Road, the eastern terminus of Stephenson's Rocket-driven railway, whose elegant station building is one of those you can explore within the museum. Connected beneath the tracks is the original station warehouse, home to some exhibitions that aren't as exciting as their curators hoped they were, while another old building contains working engines and locomotives to delight anyone with a penchant for grease. 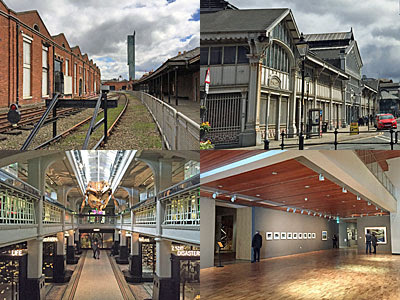 Other attractions include the Great Western Warehouse, home to everything you ever wanted to know about the manufacture of textiles, and a reproduction of the world's first computer - something else Manchester is rightly famous for. Across the road is the Air and Space Hall, with exhibits including an Avro Shackleton, a Spitfire and a locally-produced Ford Model T. And all extremely child-friendly, if the number of under-10s I saw grinning their way round were anything to go by. For the history of the city, try MoSI (above). But for biology and geology, try this redbrick repository (part of Manchester University) located some distance down Oxford Road. Most impressive is the narrow three-floor central gallery of mostly stuffed animals, with a kid-oriented investigative zone on the upper floor and Horniman-esque glass cases intelligently filled below. Children were also loving the live animals in the vivarium (look mummy, a frog! ), as well as the prehistoric bones and minerals stacked up in further galleries elsewhere. 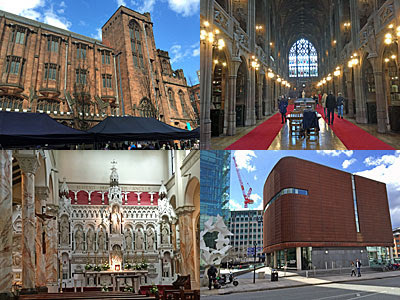 Further still down the Oxford Road, and very much within Student Territory, the revamped Whitworth was the proud winner of the Museum of the Year 2015. Bordering the local park, and taking its inspiration thereof, this Edwardian building has been recarved and extended to create fresh new galleries with a crisp modern touch, and a series of varied exhibitions within. The portraits cluster I enjoyed, the filmset video installation less so, but the true eye-opener was a retrospective of the work of Tibor Reich in the gallery upstairs. This Hungarian textile designer moved to the UK after the war, taking his inspiration from natural textures to introduce vibrant colour schemes to austerity Britain - Concorde's upholstery was one of his - and he was a dab hand at ceramics too. Throw in a galleryful of 1950s and early 60s wallpaper designs nextdoor, and I left beaming.